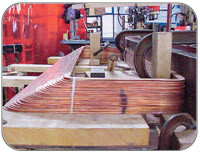 Stimple & Ward Company manufactures Turbine rotor coils up to 10 feet in length. These coils are manufactured with extreme care and precision. Turbine rotor coils are designed and manufactured based on precise rotor measurements to ensure each turn lies in the correct position in the rotor slots without stress points. All corner buildup is removed to ensure a uniform coil height throughout the winding. Copper Dimensions .040" x .375" Through .500" x 3.000"
Coil Dimensions Turn Width: Fully indexable in .010" increments, up to 60" maximum. 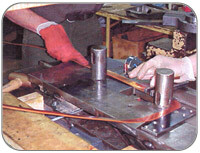 Set-up / Tooling Our Set-up / Tooling Charges are among the lowest in the industry. With ovcer 40 years of edgewinding experience, we have developed various processes and an extensive inventory of dies to draw from to keep tooling costs low. 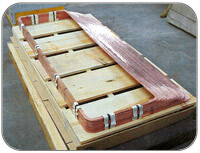 Delivery Normally 6-8 weeks, however may be shorter depending on availability of copper strip. We maintain inventory of many common fractional inch sizes to better serve our customers and reduce lead times.